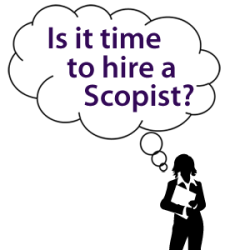 Court Reporters: Is it Time to Hire a Scopist? 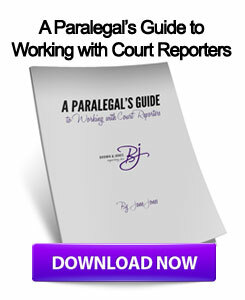 Every court reporter knows that the workload in the legal industry ebbs and flows. Some months you are easily able to finish transcripts on time, maybe even earlier than the deadline. Other months you are pulling your hair out with too many pages to finish and not enough time. How will you produce all those pages during the busy cycle? One way to alleviate the stress when the pace is frantic is to hire a scopist to help edit your transcripts. If you have never worked with a scopist, you may be reluctant to give up control of any part of your transcribing process. You may also not want to share revenue. But the fact remains, if you have too much work and not enough time, something has to give. A scopist can perform the initial edit of a transcript, allowing you to breeze through your editing much faster, using your time to perform the most important parts of the transcription process. Even if you are a clean writer, working with a scopist will help you produce more pages. It is true, you will need to be ready to give up control of part of the transcription process. That doesn’t mean you will be sacrificing quality over quantity. The quality of your transcripts is still in your hands. Your scopist will perform an initial edit and work on the areas that are easy to edit. This is not a crucial step that needs to be performed by you. The later stages of transcription will still be in your control. The final transcript will not go out before you have finished editing and proofreading the transcript. When time is scarce, you need to spend your time on the most important tasks that must be performed by you. Outsourcing the initial editing to a scopist will allow you to keep control of the process, turn out an excellent transcript, and allow you to produce more pages with less time spent by you. It is true you will need to pay your scopist a portion of the revenue that you are collecting for transcripts. However, a scopist does not become an added expense. Instead, the expense of hiring a scopist is an investment that allows you to bring in even more revenue. While you will be sharing revenue with your scopist, you will also be bringing in more revenue from the increased number of pages you will be able to produce. This increase in revenue will cover the amount you will be paying a scopist. How much more would you be able to make in income if you were able to accept more work assignments? In most cases, the increase in revenue will more than cover the expense of the scopist, allowing you to boost the amount of revenue you are able to keep as income. If you are a freelance court reporter, you are a small business. Every good business knows how to increase production when demand is high. Outsourcing part of the transcription process is a good way to scale your business when there is more demand for your services. Your clients are relying on you to be able to handle an increase in work flow. Hiring a scopist allows you to scale production while still retaining the quality of your product. Another good reason to hire a scopist is when you have an expedited transcript order. If you have a relationship with a good scopist, your stress level will decrease tremendously when you get that call asking for yesterday’s all-day deposition transcript within 24 hours. Rather than panic, you will be able to contact your scopist to make sure she or he is available to work on your project immediately. Your scopist can begin working on pages, and sending them to you a few at a time so you can work on the final edit and proofreading. That time savings can mean a world of difference when you get that call for an expedited transcript. If you are considering hiring a scopist, you will want to be sure that it is a smart decision. Are you struggling with deadlines? Do you wish you could accept more work assignments? If the answer to one of those questions is yes, then it might be time to outsource part of the transcription process by hiring a scopist. This entry was posted on Tuesday, December 3rd, 2013 at 1:15 pm	and is filed under Court Reporting. You can follow any responses to this entry through the RSS 2.0 feed. You can skip to the end and leave a response. Pinging is currently not allowed. I think this is a wonderful article that could benefit many reporters, their agencies…and scopists. As you note, so often reporters only think of a scopist as an expense rather than as an investment in the opportunity to perform what is their truly unique and most valuable talent: writing the record. Thanks for being so articulate about it.